He has become an ever-present in the side since March after struggling to establish himself in the team. "It was a great moment for him," Hargreaves told BBC Sport. "At the end of the day he'd been written off by a few people. "But I saw him as a project, as someone I could put my arm round and say 'do it right off the pitch and train hard and you've got a chance'. "And he did it and I'm so pleased for him because it gives him a reward for all that hard work." 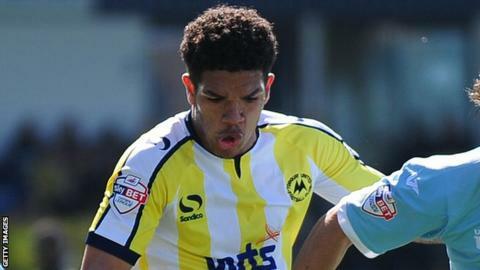 The win for Torquay keeps their hopes of survival in League Two alive, although they are still five points from safety with two games left. "We're not getting carried away, that's for sure, and we're not out celebrating," Hargreaves said. "But we have to say that the character showed to not let our local rivals be the ones to send us down. "You've got to say, as a moment in your career, has has got to be enjoyed. "The rest of it is my job to sort it out and I'm going to damned well do it."